As part of NVIDIA’s suite of GDC 2015 announcements, the company has announced that their GRID game streaming service is getting a promotion from beta to a commercial service. 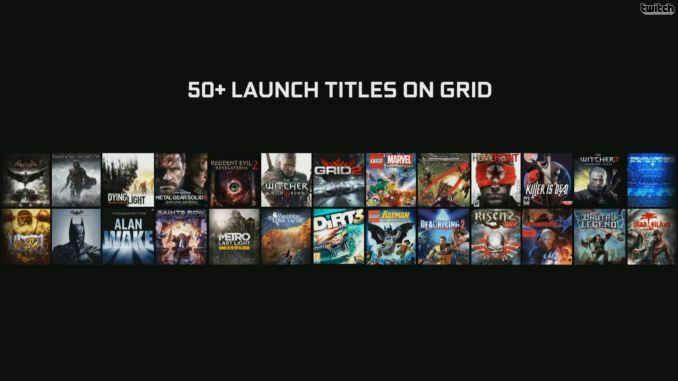 First introduced back in 2013 as a beta project for NVIDIA’s SHIELD Portable to demonstrate the streaming capabilities of the combined Kepler + Tegra ecosystem, the GRID gaming service has been slowly built up over the years. 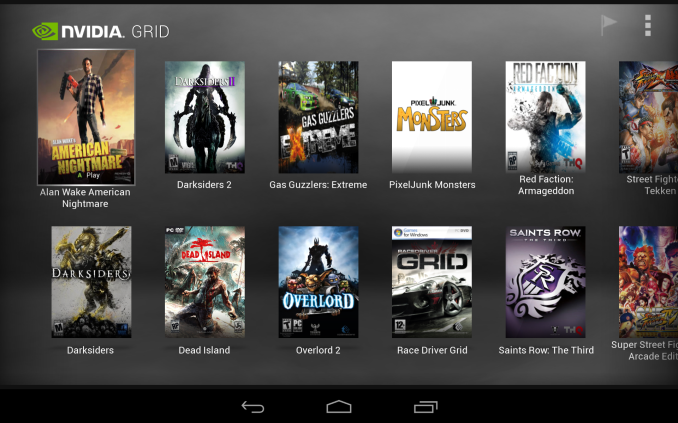 Later in 2013 NVIDIA added console mode, extended the service to the SHIELD Tablet, and most recently the company has greatly expanded the number of games and server locations the still-in-beta service offered. All signs as of late have pointed to NVIDIA seeking to bring the service out of beta – particularly the June 30th expiration date – and tonight’s announcement reflects exactly that. The commercial version of the service will launch in May alongside the SHIELD Console, and while maintaining the overall design and feel of the current beta service, NVIDIA will be making changes to accommodate its switch from a purely free service. First and foremost the service will see 2 tiers introduced: basic and premium. Both tiers come with free games, similar to the current GRID beta, with the premium tier getting additional (and likely more recent) games. NVIDIA has not yet announced a price for either tier, however NVIDIA has been careful to call both tiers “subscription” tiers, and with subscription running orthogonal to free, there’s reason to believe that both will be paid services. As for the newest and greatest games (that NVIDIA presumably can’t get service-wide licenses to), NVIDIA will also offer a game purchasing service to allow users to buy individual games. This functionality does not exist in the current GRID beta, but of the few preview screens we’ve seen it looks like pricing will be in-line with retail PC game purchases. Meanwhile for non-SHIELD owners hoping to take advantage of GRID, it’s looking like you will be out of luck. NVIDIA is currently only talking about GRID for SHIELD device owners, which is consistent with their use over the last few years of value add features to drive hardware sales. 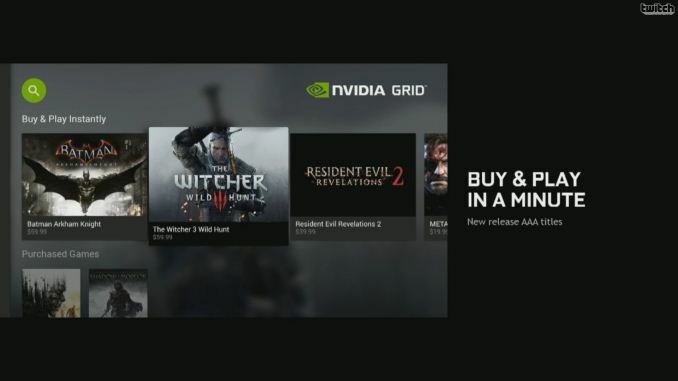 GRID exists to sell SHIELD consoles, not for NVIDIA to get into the business of running a game streaming service. In fact the launch of a commercial version of the GRID service is something of a change in direction for the company. 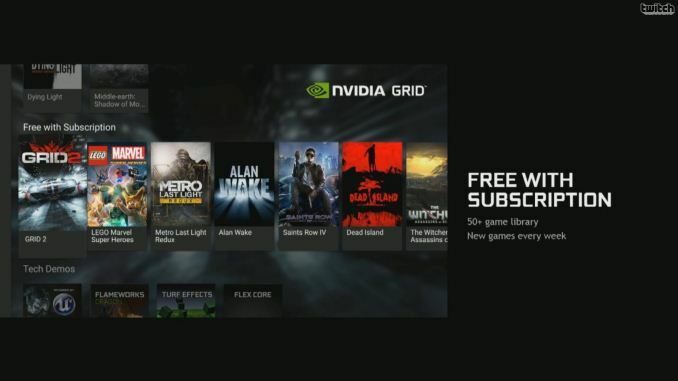 NVIDIA’s original plans for GRID involved partnering with game streaming start-up Gaikai, a plan that came to a halt when Sony bought Gaikai and used them to build Playstation Now. Since then we haven’t seen any other serious contenders in the PC game streaming space, and NVIDIA for their part has opted to go it alone. Meanwhile from a technical perspective, the GRID service has not substantially changed since beta. Now that NVIDIA has expanded beyond San Jose, the actual server locations are being backed via Amazon’s AWS, which is already a large customer of NVIDIA GPUs. NVIDIA’s target to beat on lag is 150ms, a number the company believes is fast enough to be reasonably playable, but also because that’s the number the company has previously stated they believe they need to be at to be competitive with consoles – especially games that only update at 30Hz. Wrapping things up, NVIIDA tells us that when the commercial service launches in May, the company will offer 50+ games, with that expanding to 100 by the end of the year. In the meantime we will be keeping our eyes peeled to see what the subscription price of the service will be and how many server sites will part of the commercial launch. 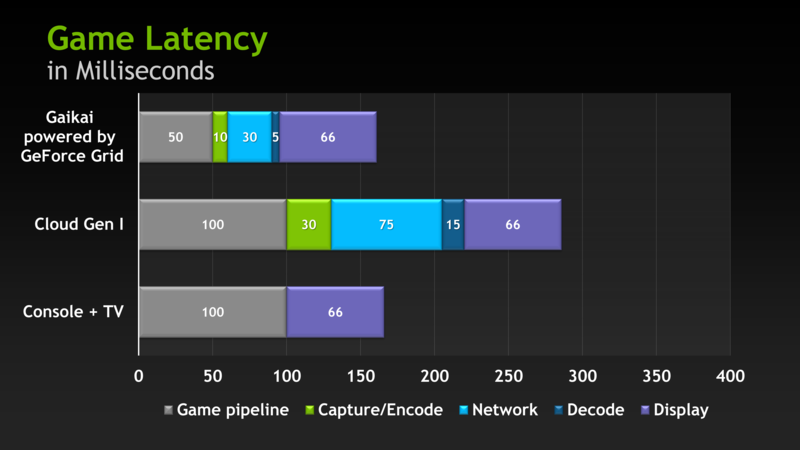 I think the 30ms total network latency they use may be too optimistic an assumption though. You are wrong about he tiers. The basic one is 720p 30 FPS and the premium one (called GRID Plus) is 1080p 60FPS. The choice of 30FPS for the basic tier is odd; 30FPS would significantly increase latency, and make people who try it out more likely to say "This is too laggy, it's garbage" and then never subscribe to the premium service. the basic tier isn't free either, and they're probably going to offer some way to try out the premium service if you already have basic to see the difference. It's a matter of cost and the quality ofthe internet connections people have. Less might be better for a lot of people that have poor connections . 60FPS would double the bandwidth and plenty US users don't have the connection needed for even 720p at 30FPS. The device is unlikely to sell much anyway at 199$ and it will be mostly in the US. In EU, Nvidia jacks up prices anyway and that's before adding 19 to 25% VAT so EU pricing will be quite a bit higher for a device that already is twice the established price for Android TV boxes. So it's still more of a testing phase for now , Nvidia doesn't seem interested in actually having customers and they are just trying to figure out costs and what kind of pricing is achievable.